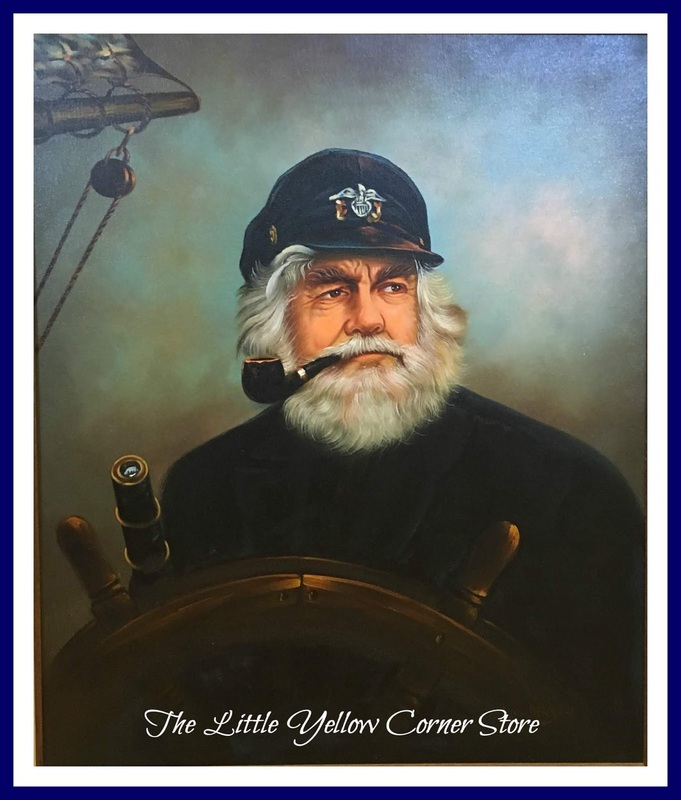 Aye Aye Captain......Are you ready to set sail once again? 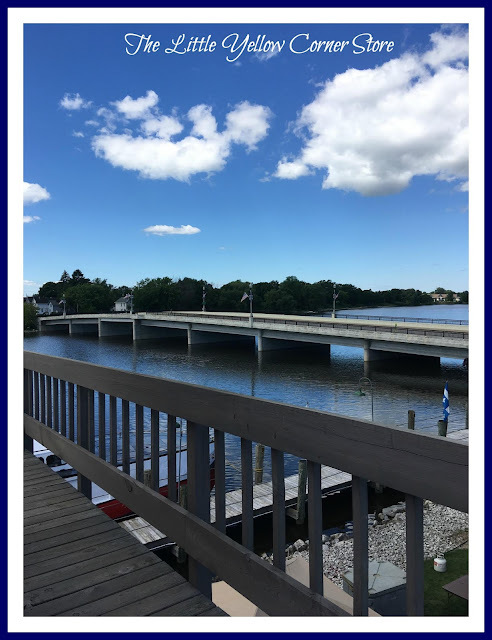 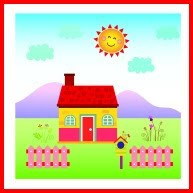 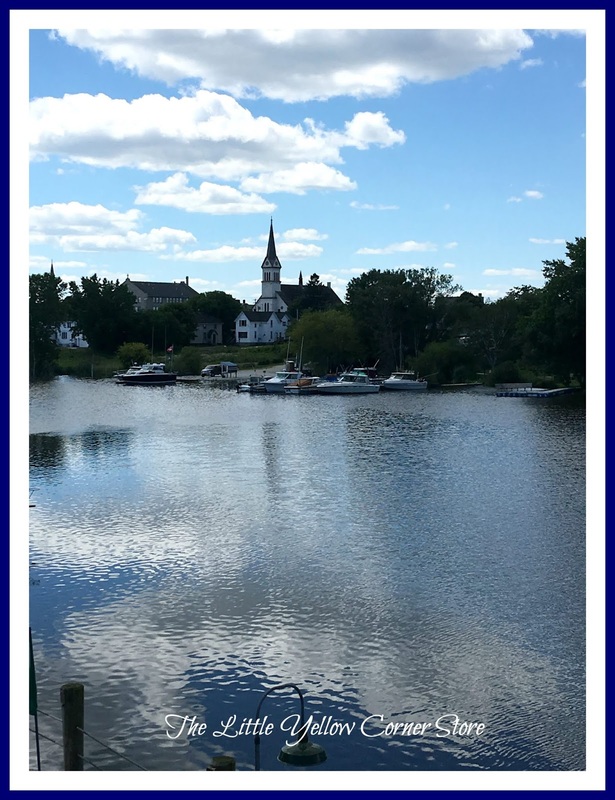 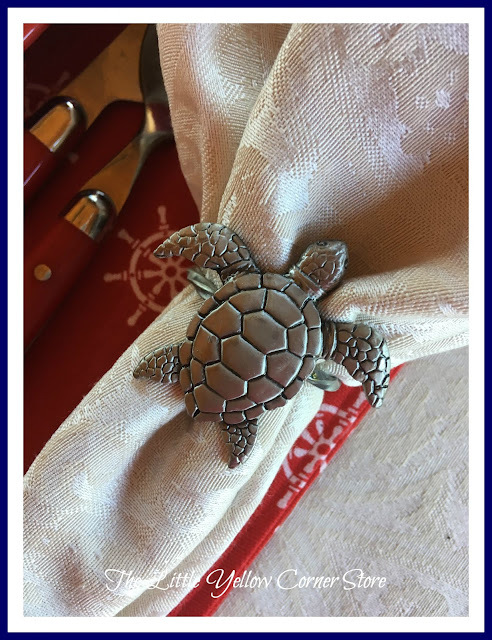 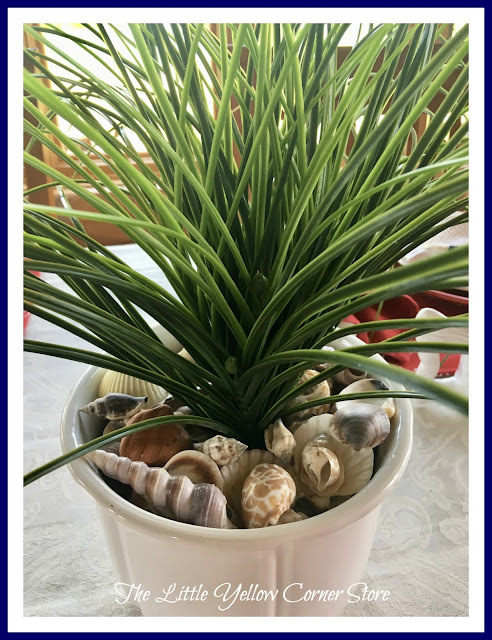 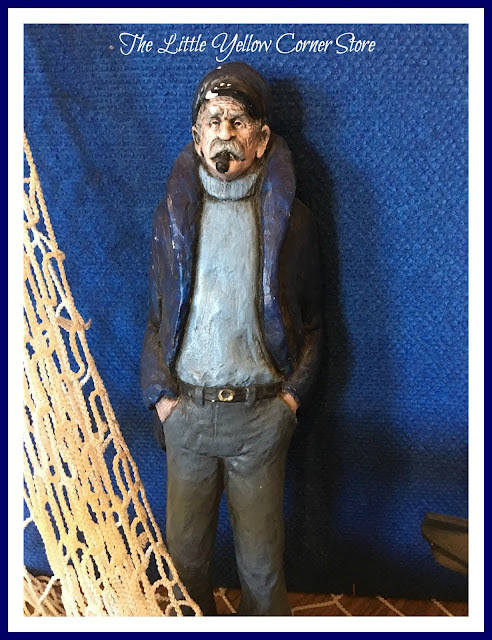 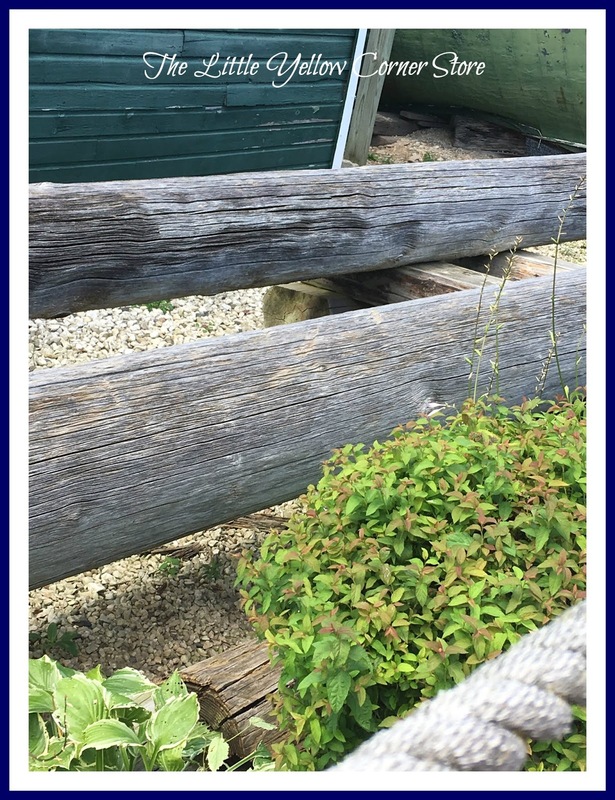 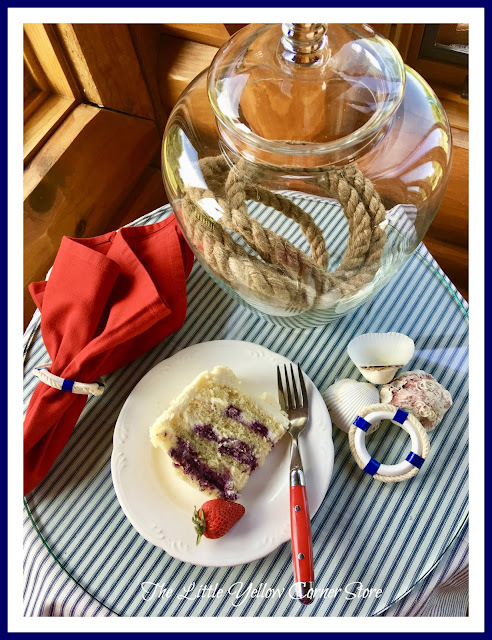 If you happened to miss my previous nautical themed post, Lets Go Cruising on the Front Porch, you can view it by clicking the following link: Lets Go Cruising on the Front Porch. This week the continuation of the nautical theme moves indoors. 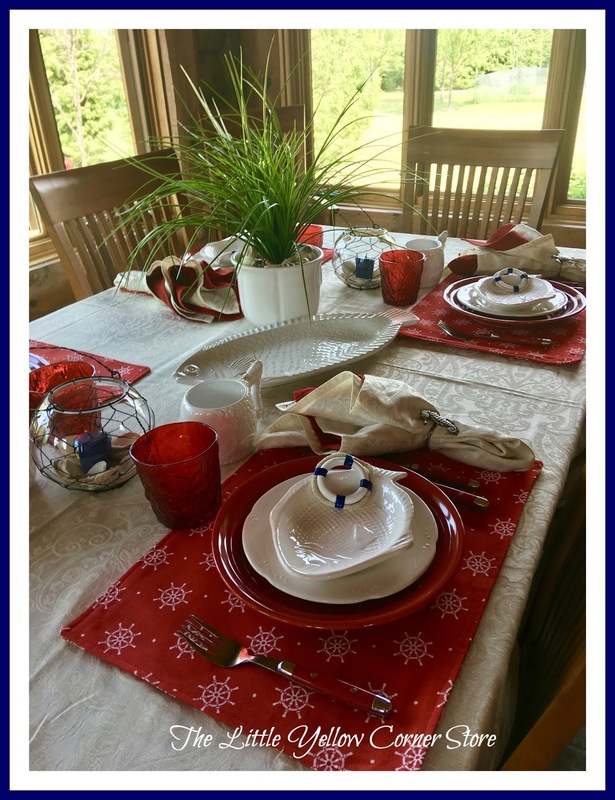 The Red and White Seaworthy Fishing Tablescape is inspired by a tour of a cute little fishing village located in the small town of Two Rivers, Wisconsin. The Rogers Street Fishing Village and Museum located on the East Twin River in Two Rivers, Wisconsin is an historical commercial fishing village which includes an 1886 lighthouse, fishing buildings, ship wreck artifacts and Native American exhibits. 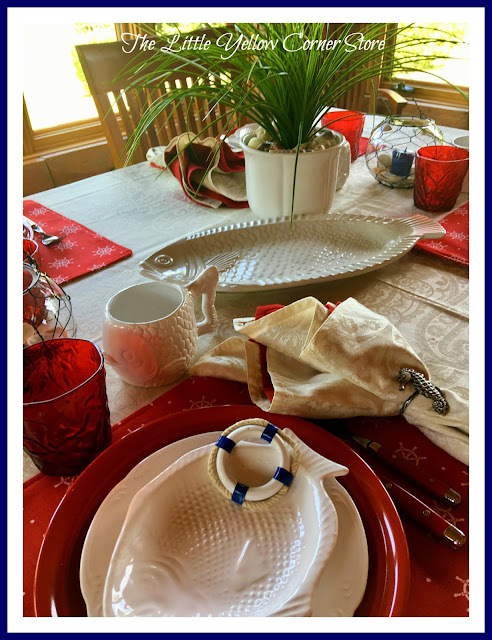 So lets first come together at the table for some dinner and fishing tales about how many "big ones" got away. 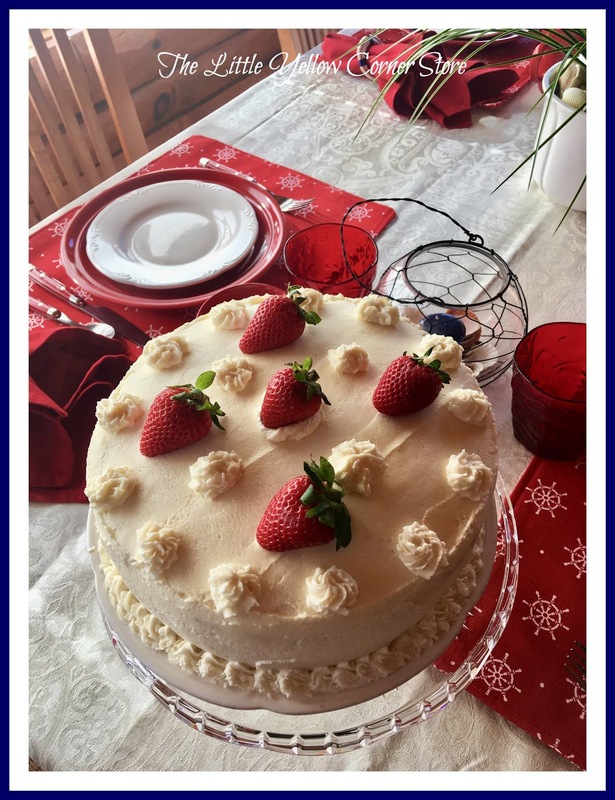 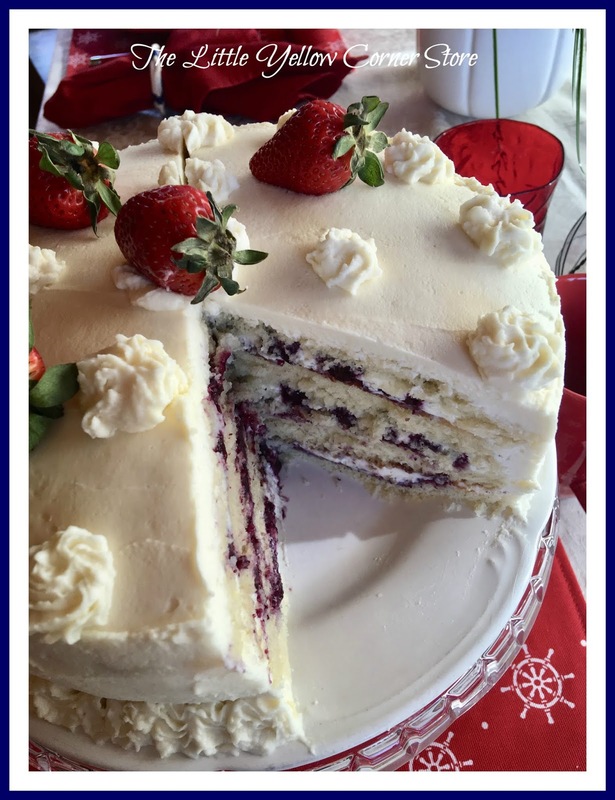 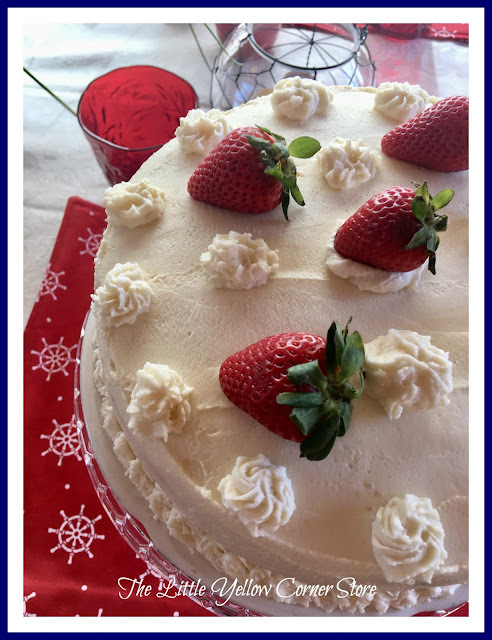 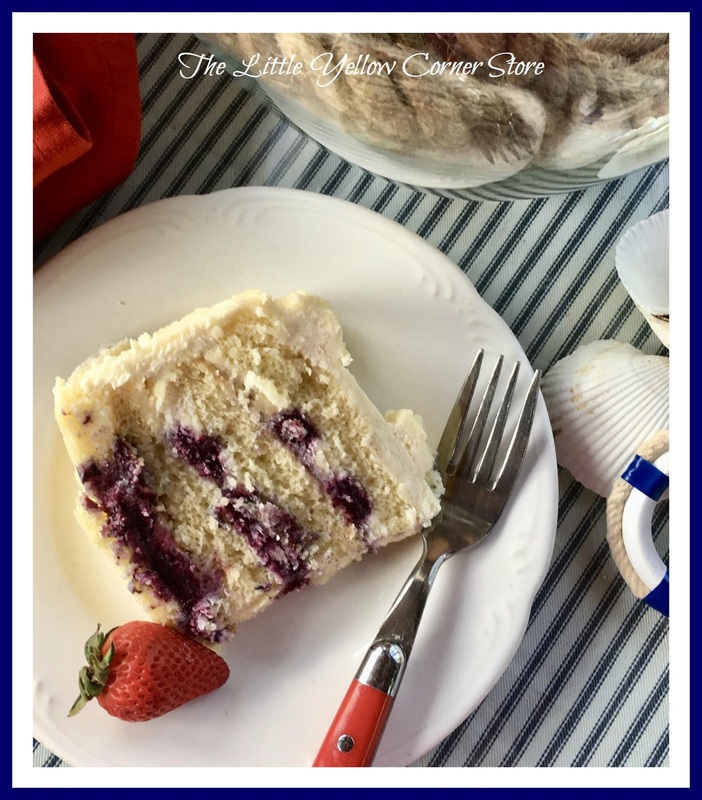 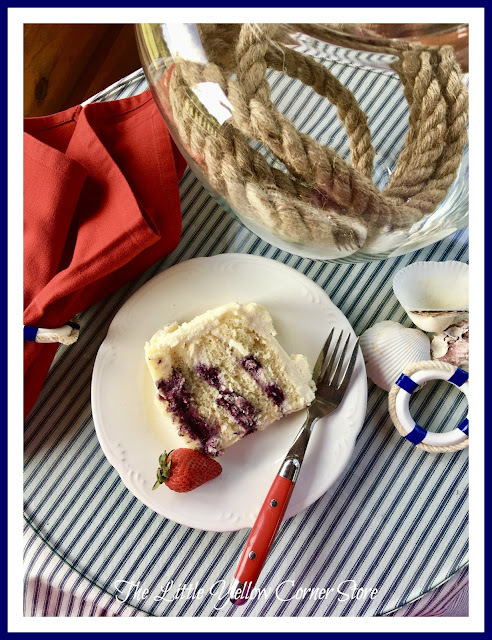 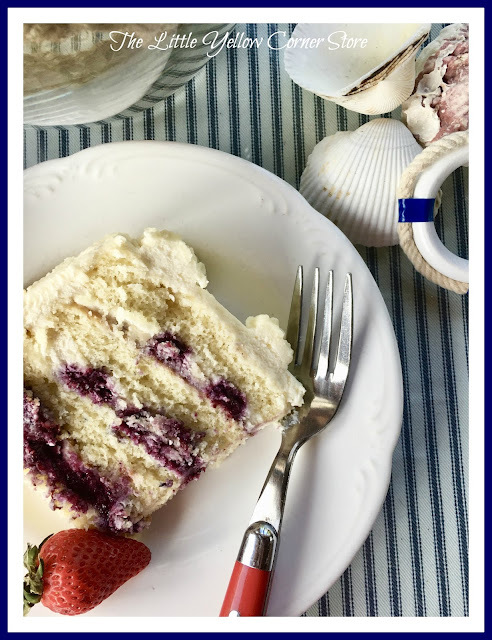 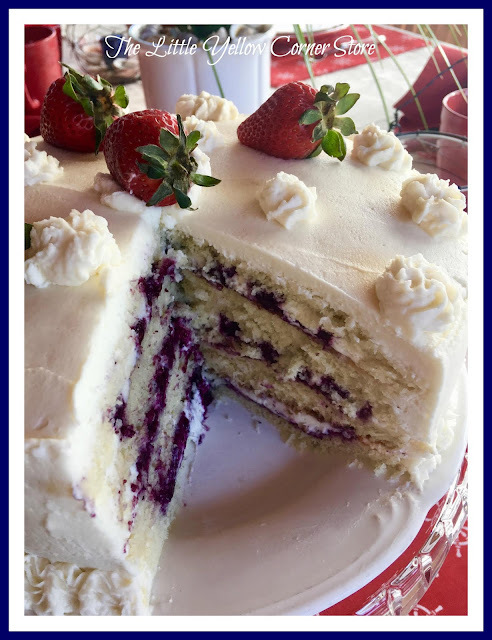 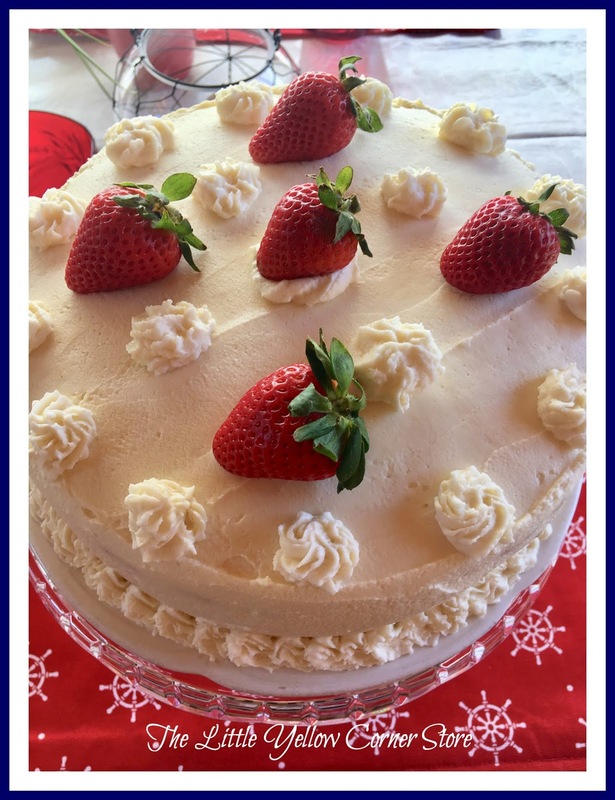 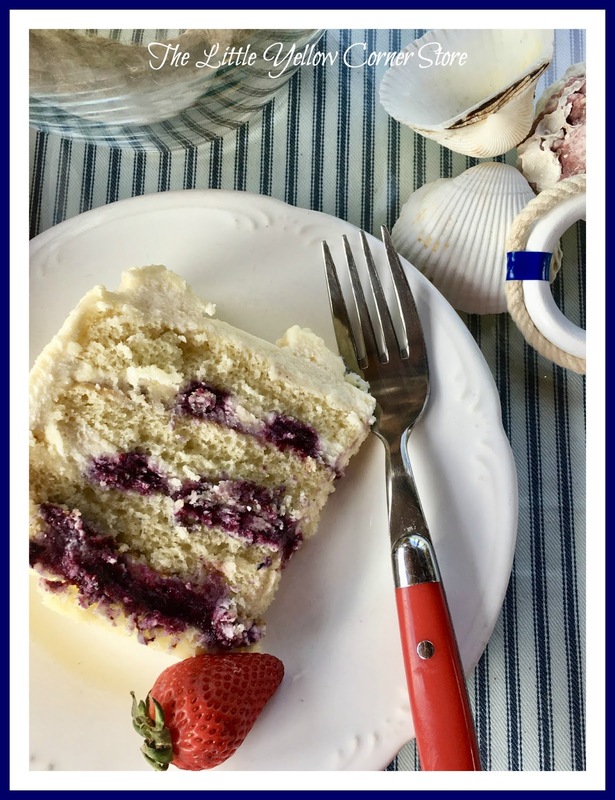 We can't forget a red, white and blueberry cake to help celebrate and commemorate the historical significance of the Roger's Street Fishing Village. Underneath this scrumptious berry cake placed on a crystal cake stand is my own red and white ship wheel place mats. 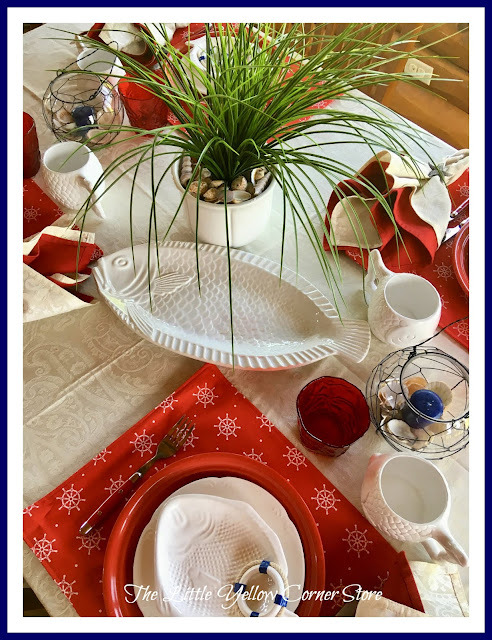 They were easy to sew and the choice of fabric for the place mats can be a limitless option for any tablescape design. 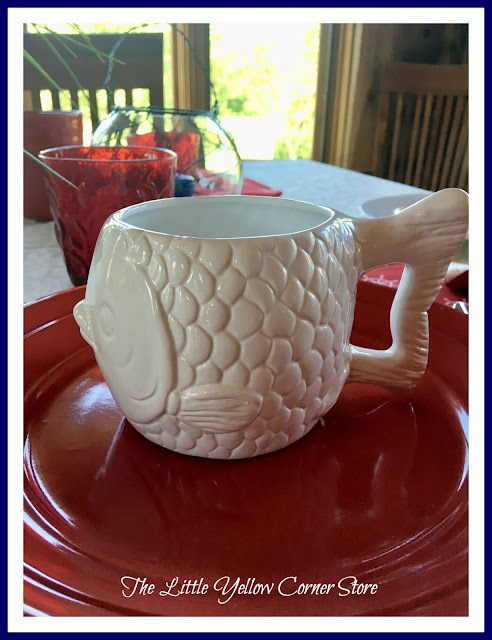 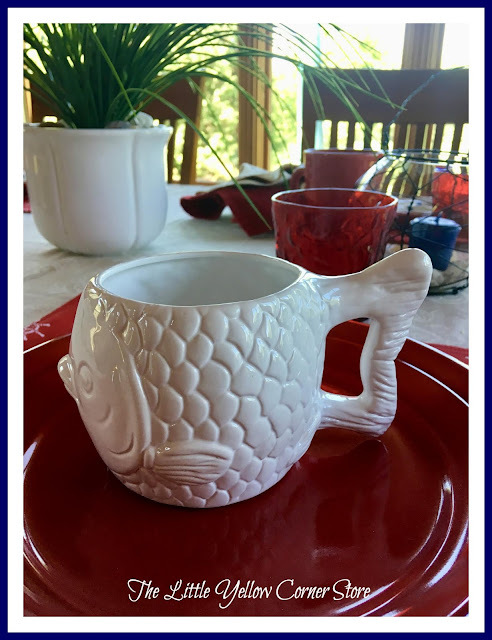 I fell in love with these white, whimsical fish mugs. If I must describe these mugs, there is but one word....."adorable." 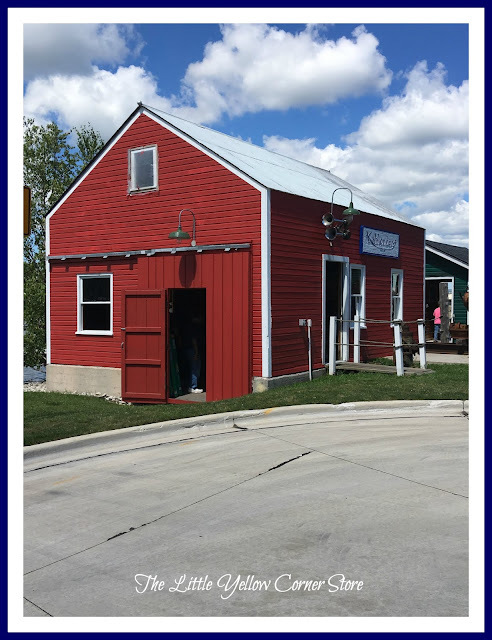 They are just as adorable as the little fishing village. And now...lets take a tour of the Roger's Street Fishing Village. 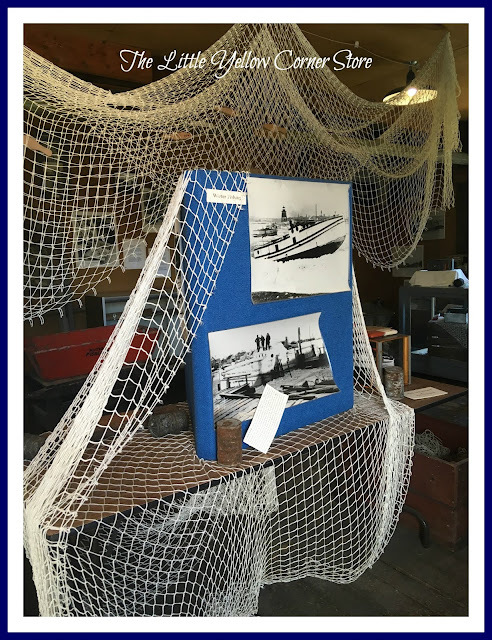 You are guaranteed to come away with a greater appreciation of life on the water for over the past 175 years. Lets begin with the 1886 North Pier Lighthouse, the shoreline of the East Twin River and some of the commercial fishing buildings. Below is a l936 wooden tug boat, Buddy O. 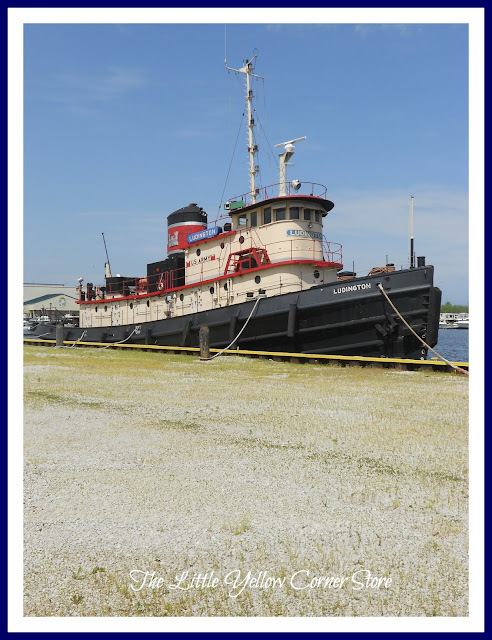 The following three pictures is of the inside of this once hard working tug boat. 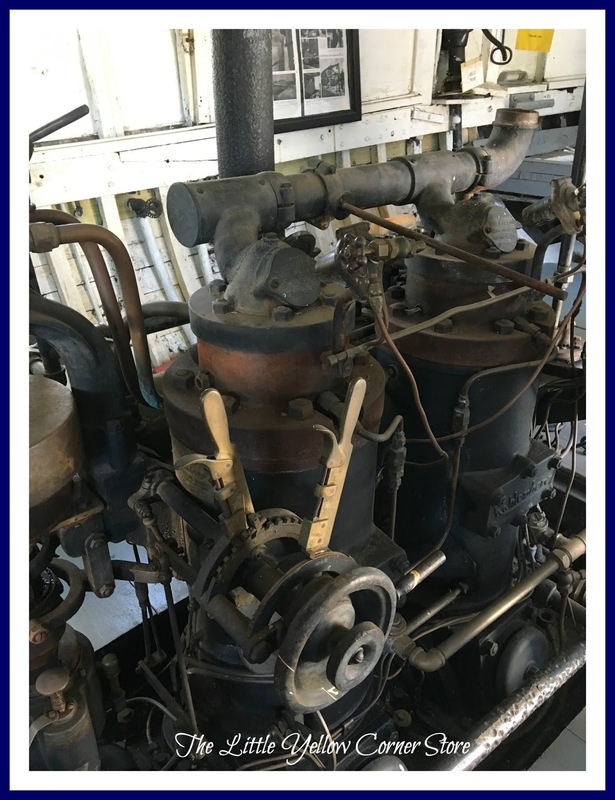 It is hard to believe the size of the engine and the inside of this old tug boat, Buddy O.
I am sure you would be amazed at how far boat engines have come from back in the days when the Kahlenberg Marine Oil engine (pictured below) powered the boats. 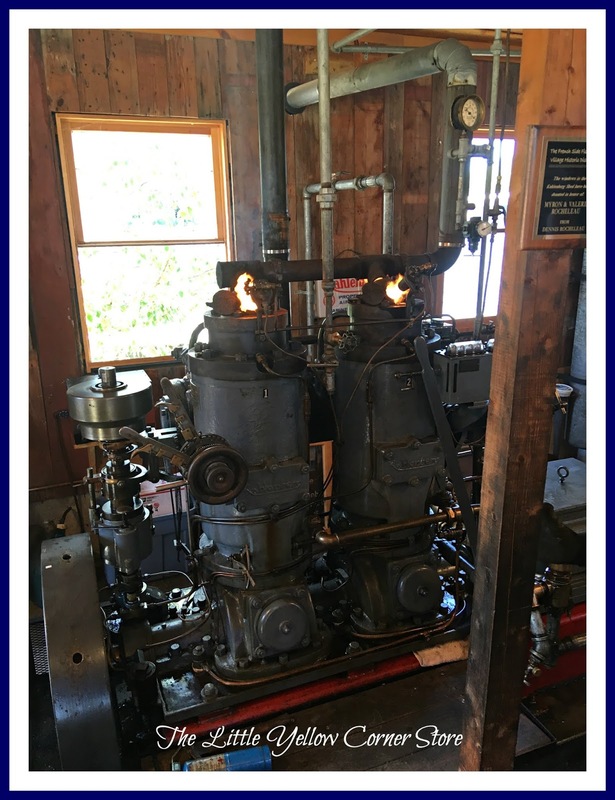 This picture shows it "fired up." 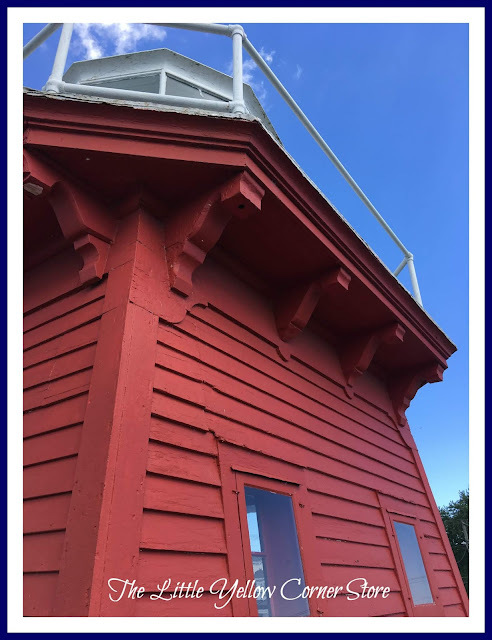 Below is the inside of this beautifully maintained lighthouse. 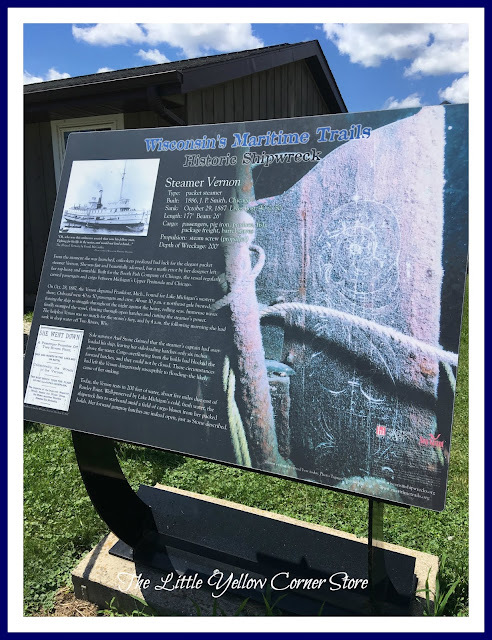 We must also remember the influence the many Native Americans had in this area and their use of the Wisconsin lakes and rivers. 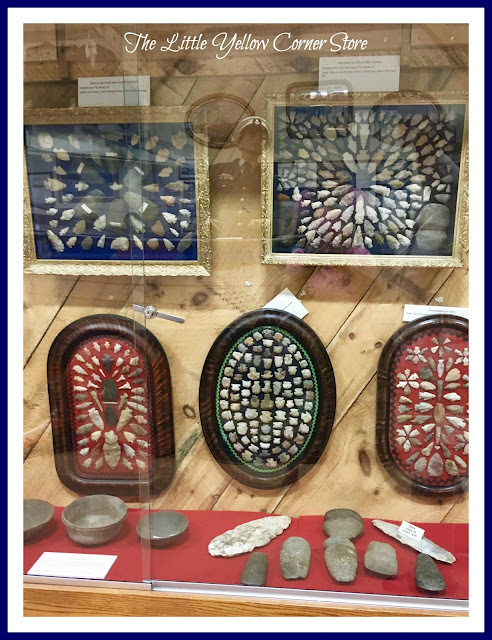 A wonderful display of their spearheads are also on display. 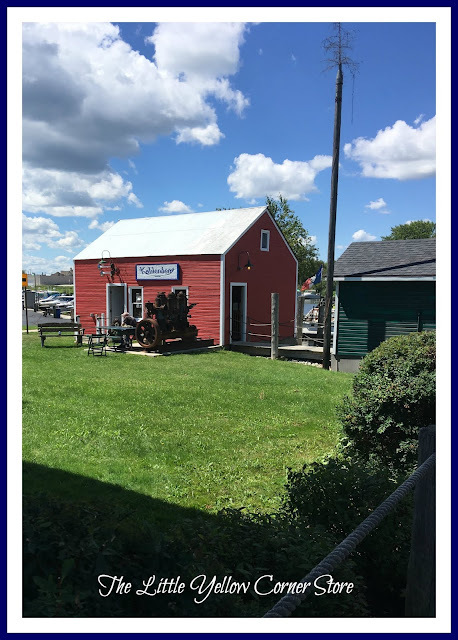 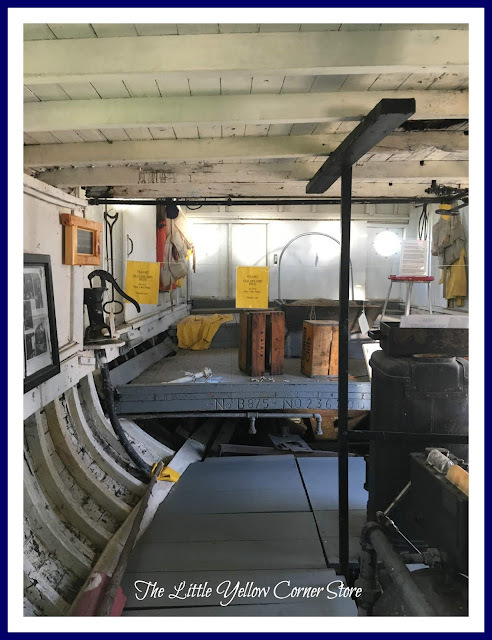 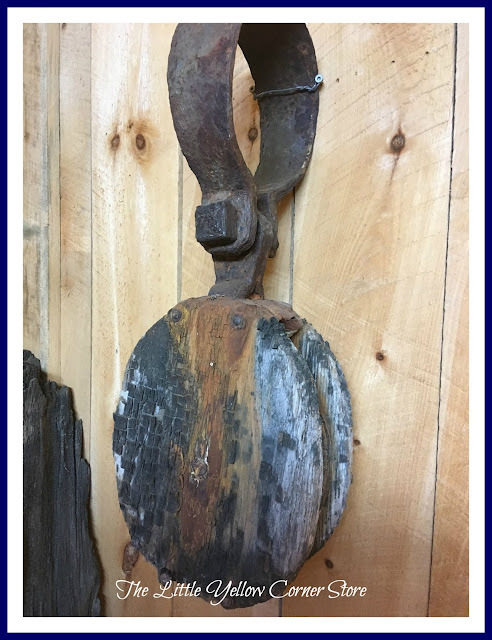 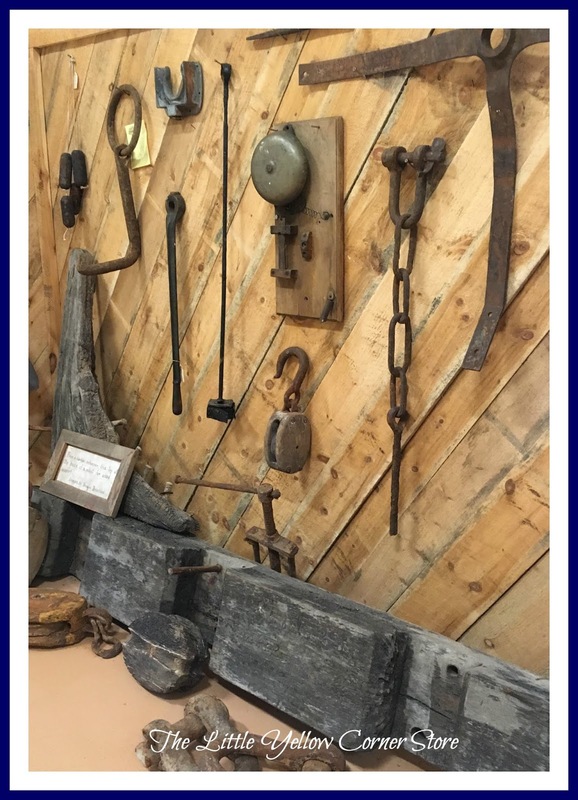 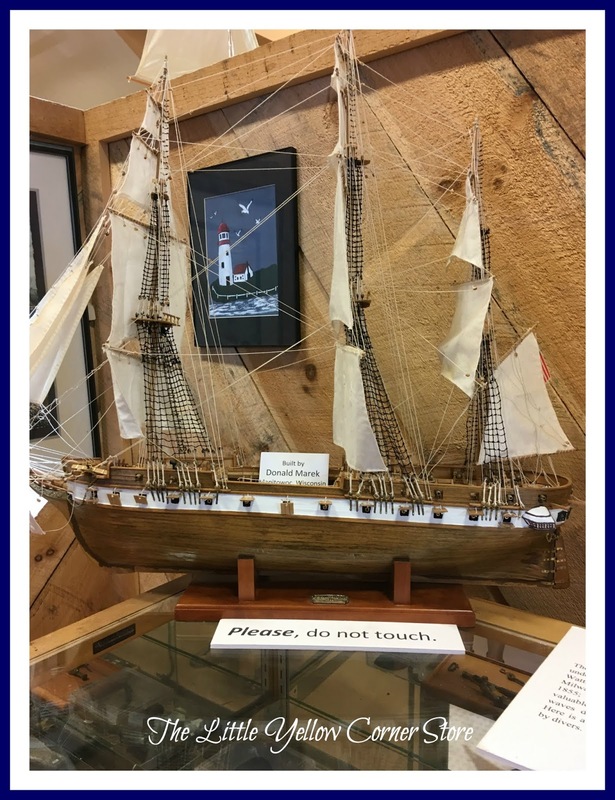 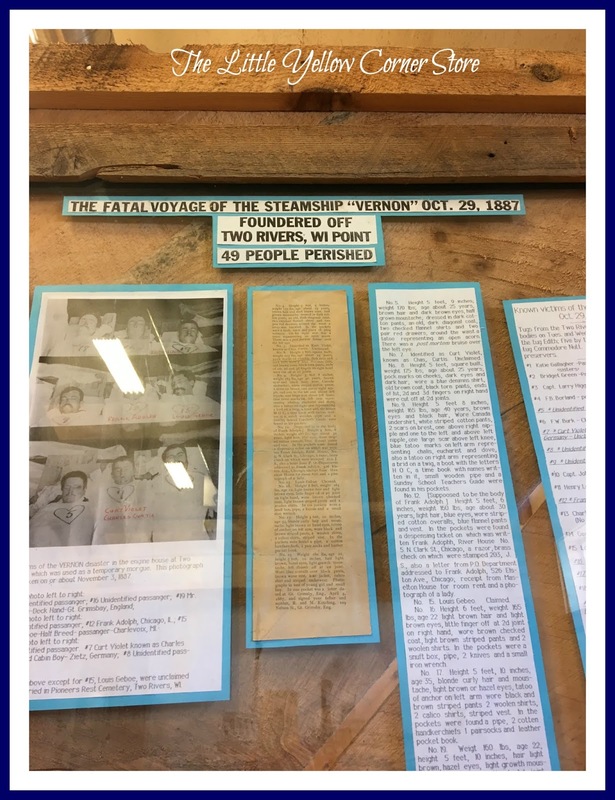 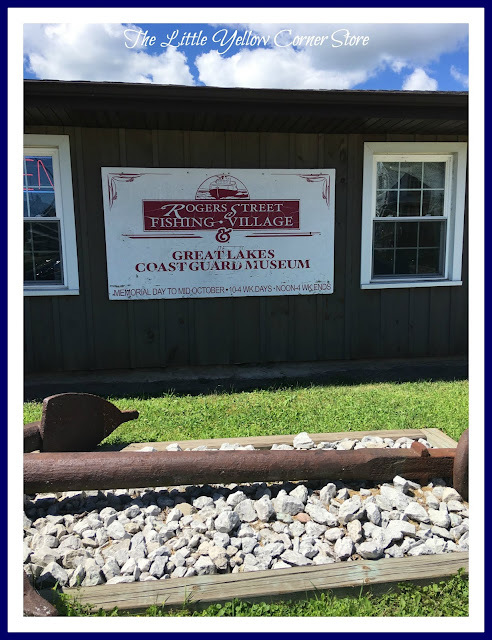 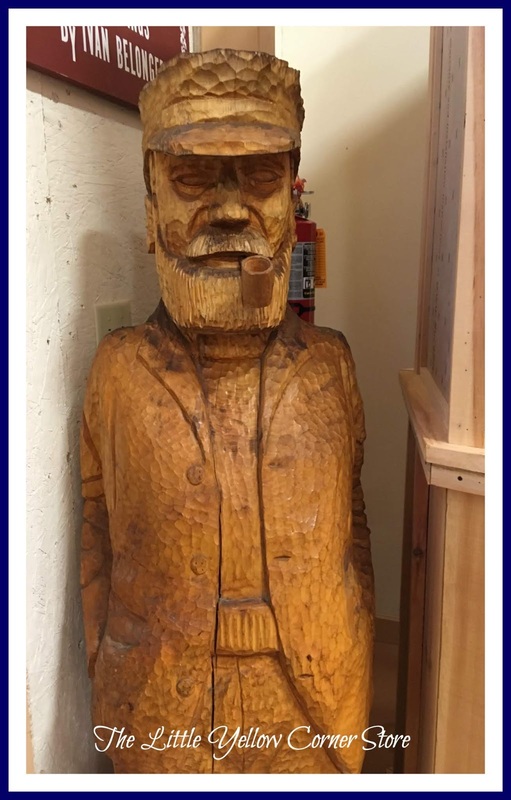 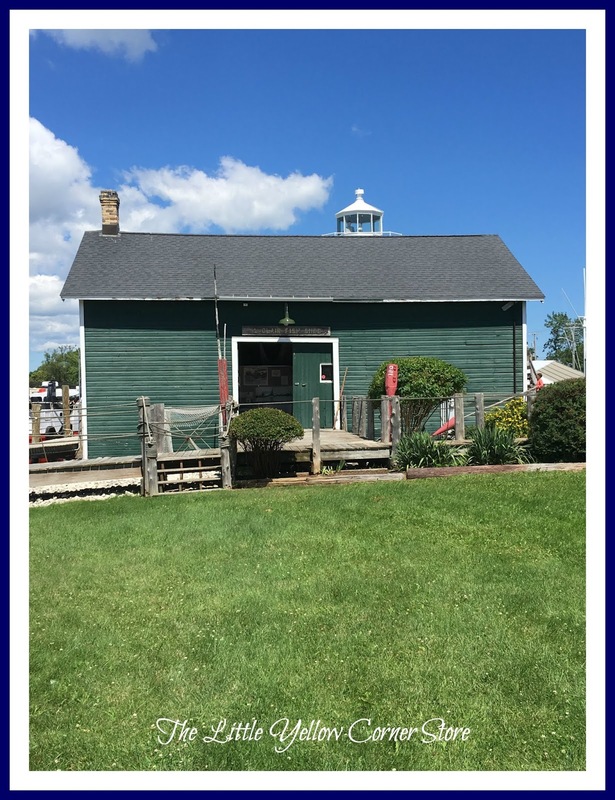 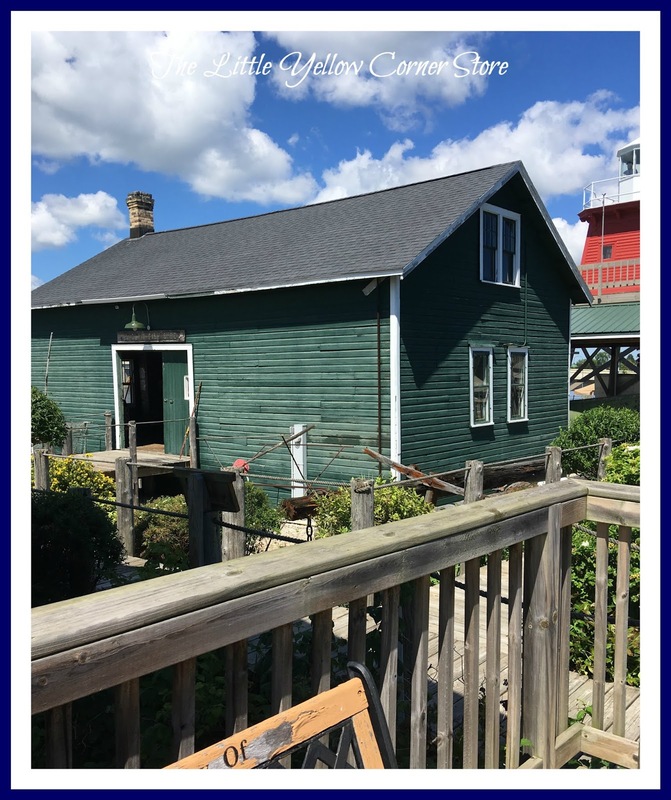 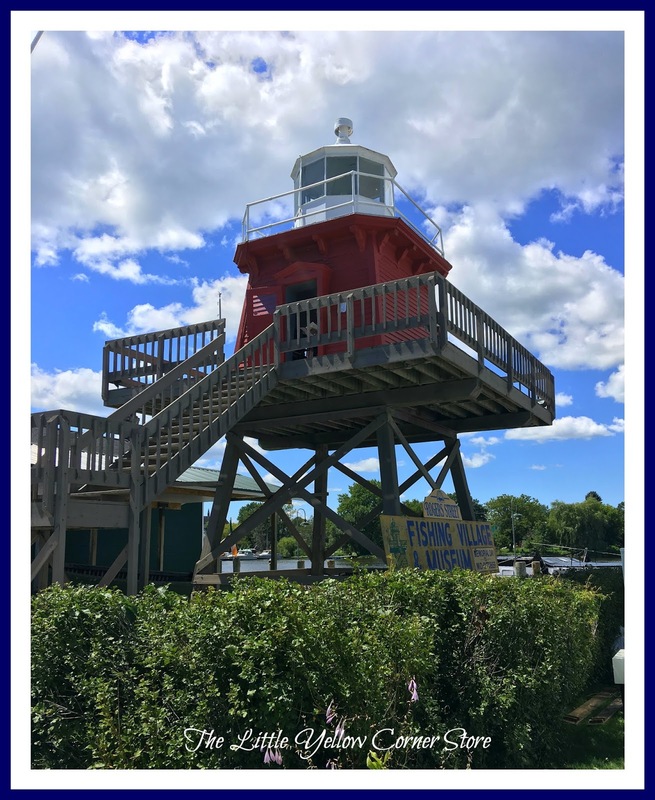 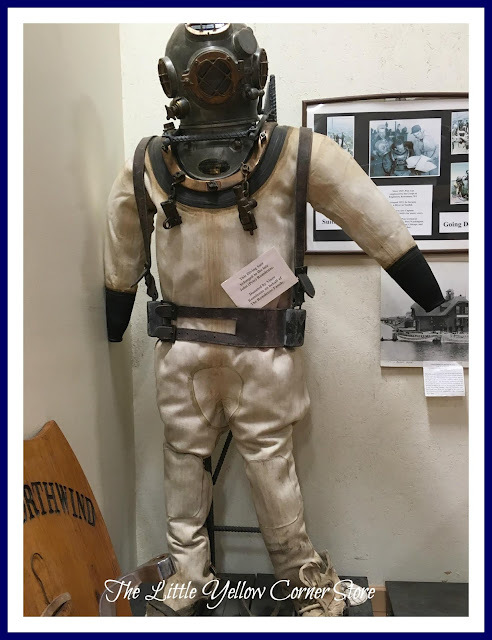 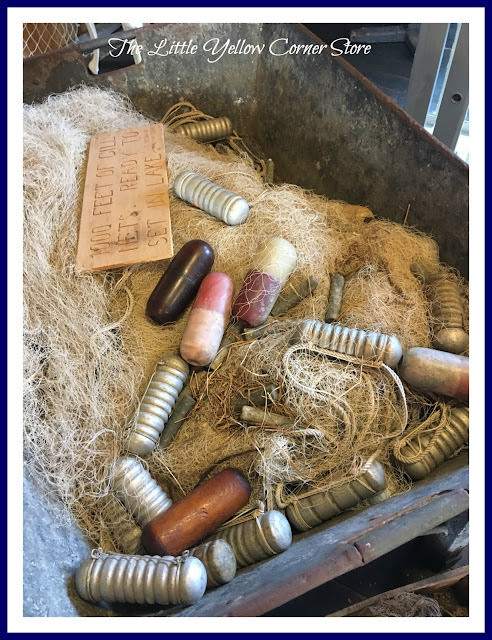 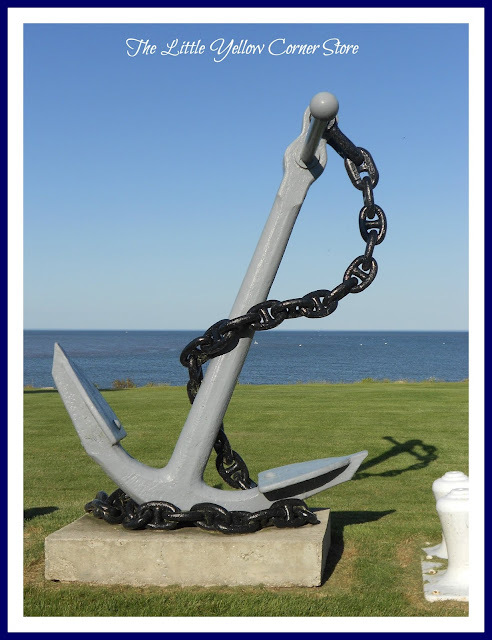 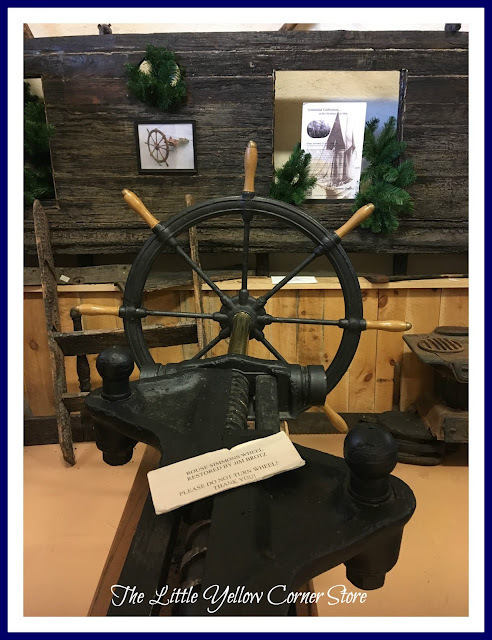 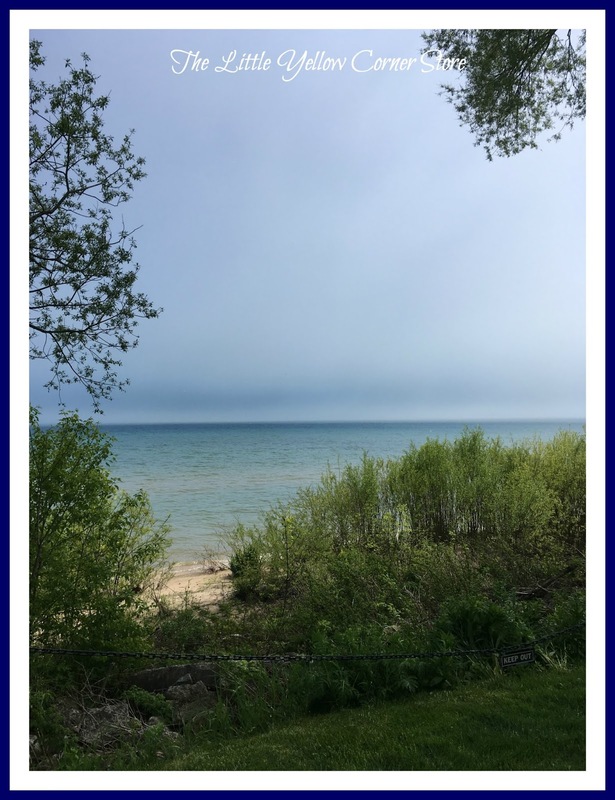 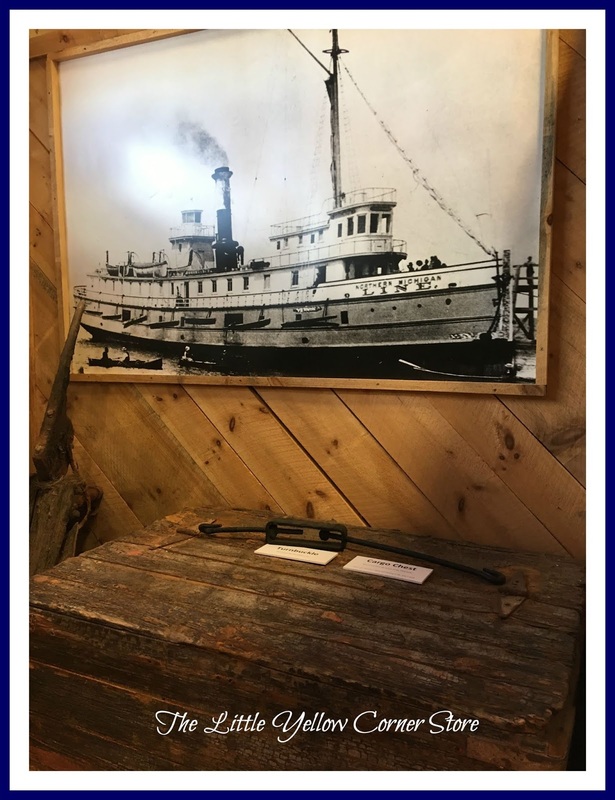 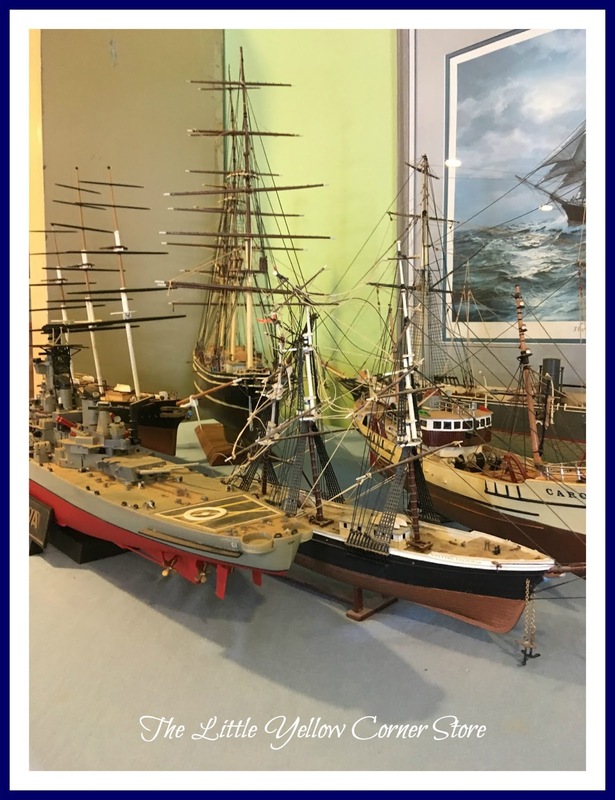 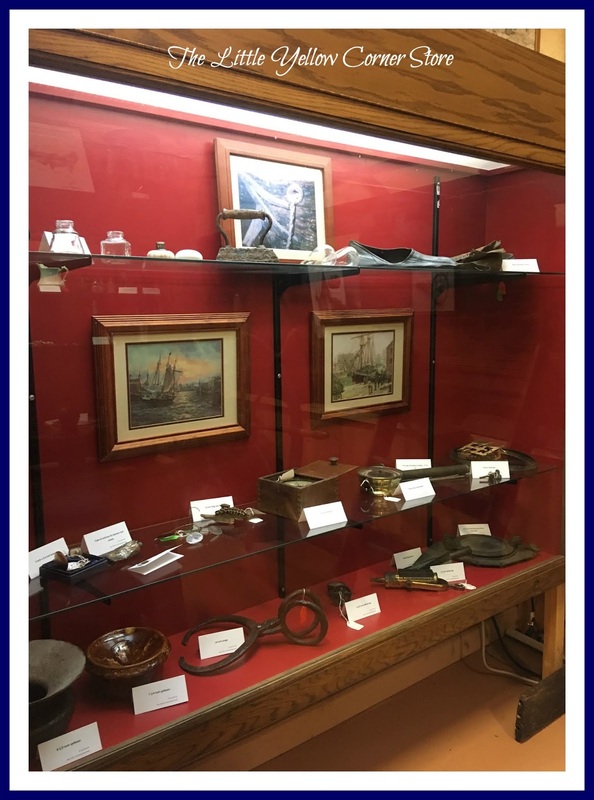 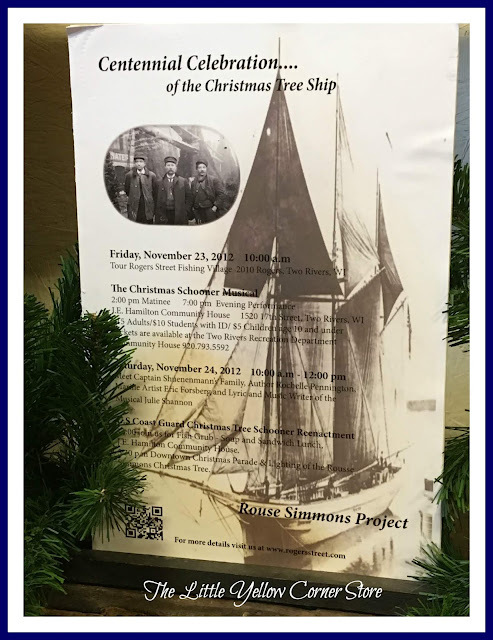 The Roger's Street Fishing Village and Museum includes information about some of the well known ship wreaks which occurred on Lake Michigan and provides many displays of the artifacts. 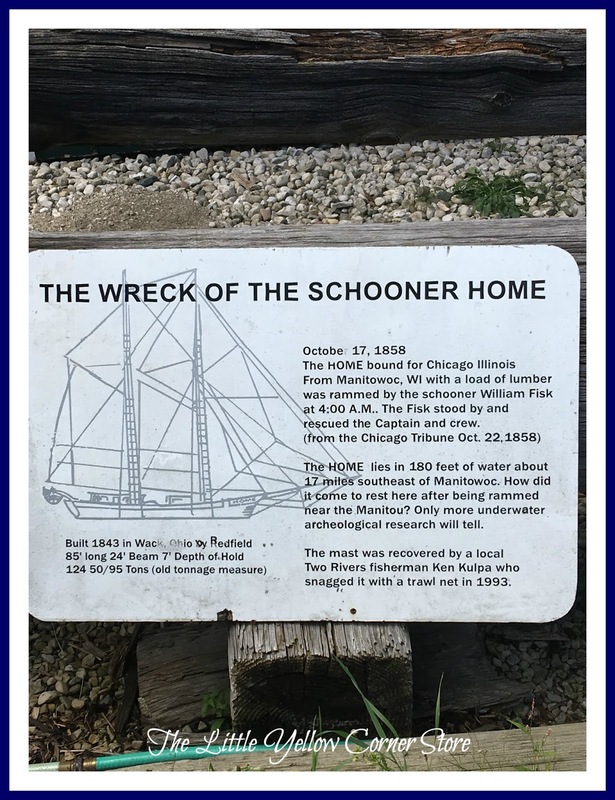 The picture below is some of the lumber recovered from the Schooner Home which sank October 17, 1858. 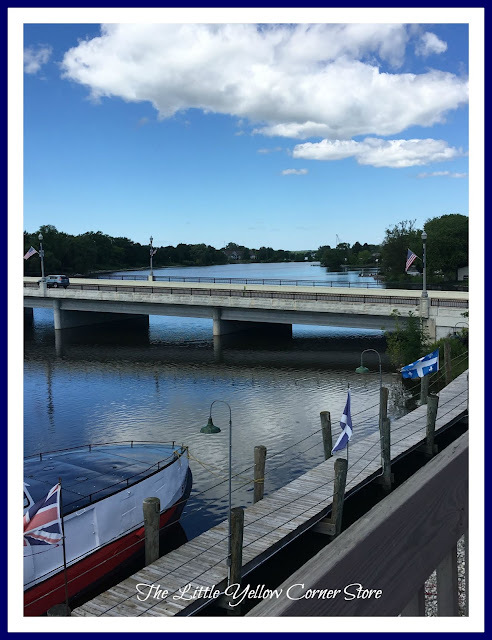 The East Twin River, one of two rivers in Two Rivers, Wisconsin. Can you guess the name of the other river? 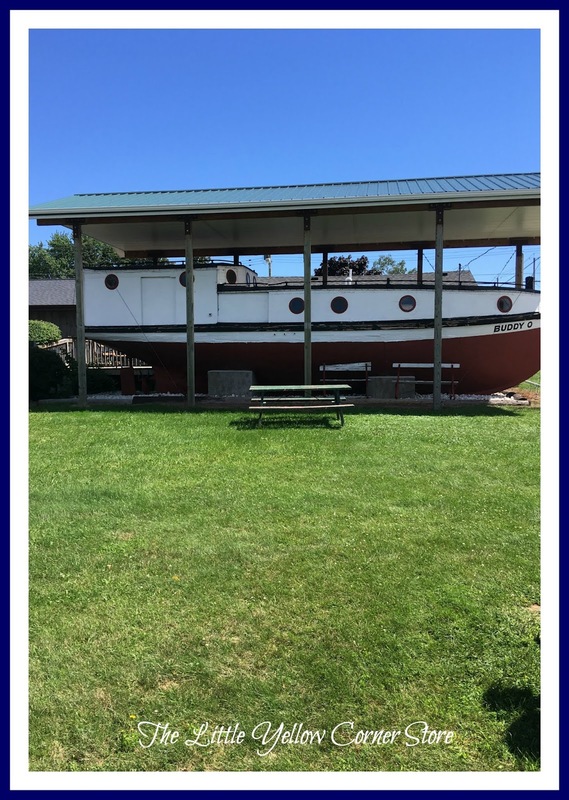 You guessed it......West Twin River. I hope you enjoyed your brief visit of this extraordinary fishing village and were pleased with the Red and White Seaworthy Fishing Tablescape. 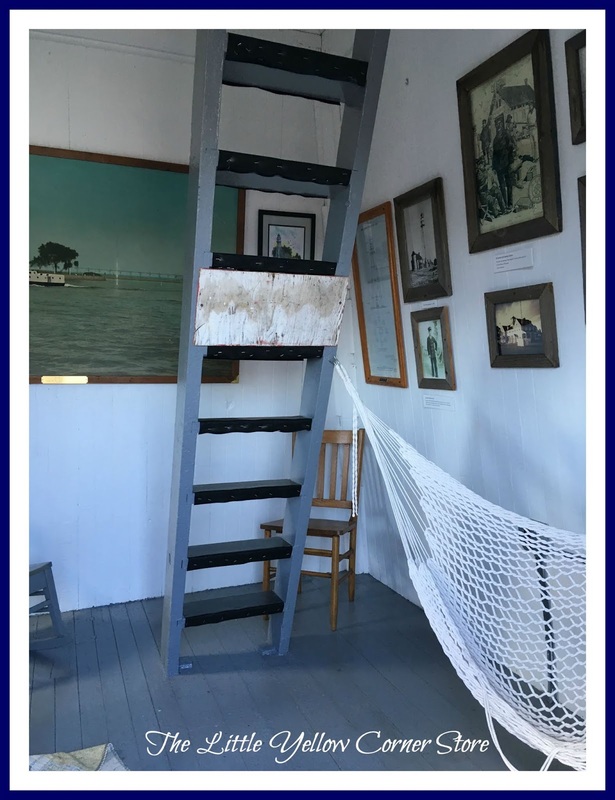 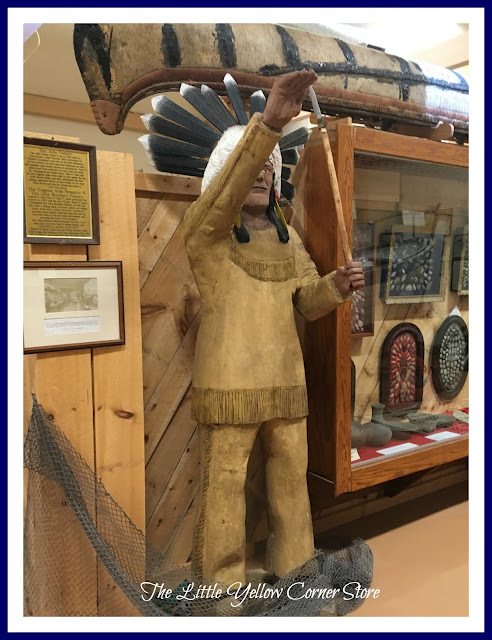 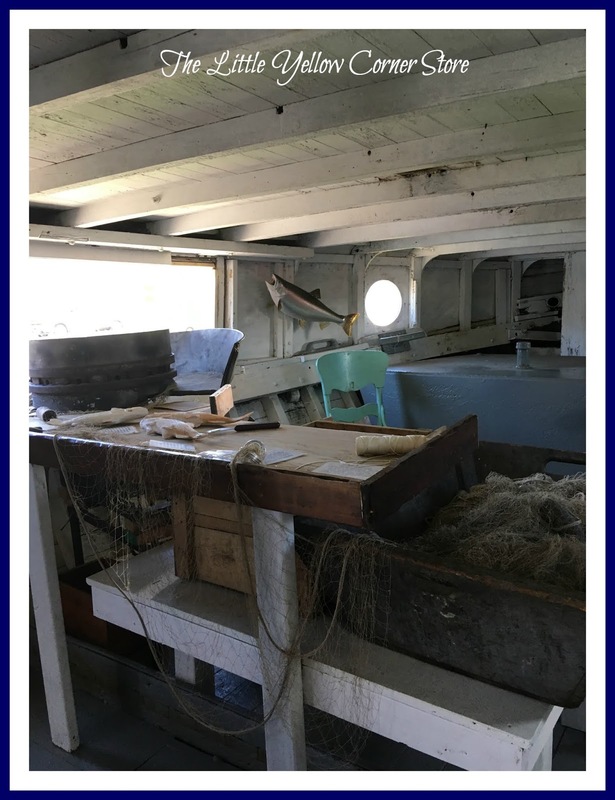 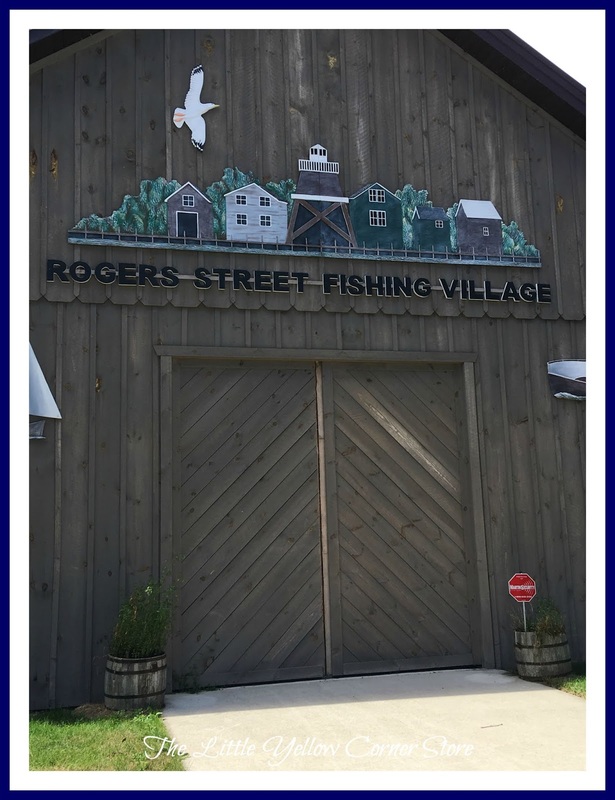 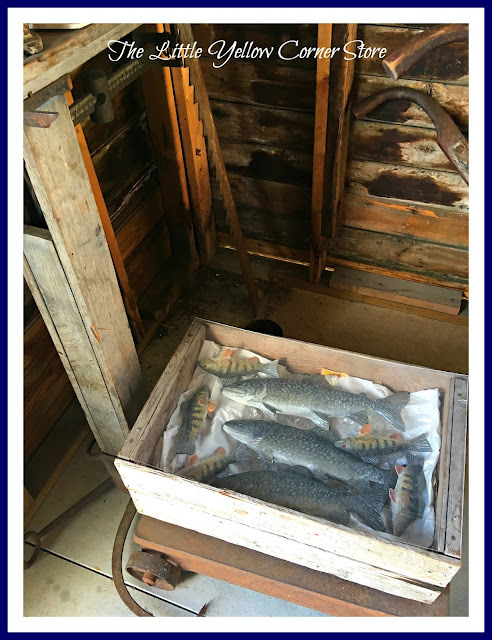 For more detailed information about the Roger's Street Fishing Village and Museum, just visit the following link: Rogers Street Fishing Village. 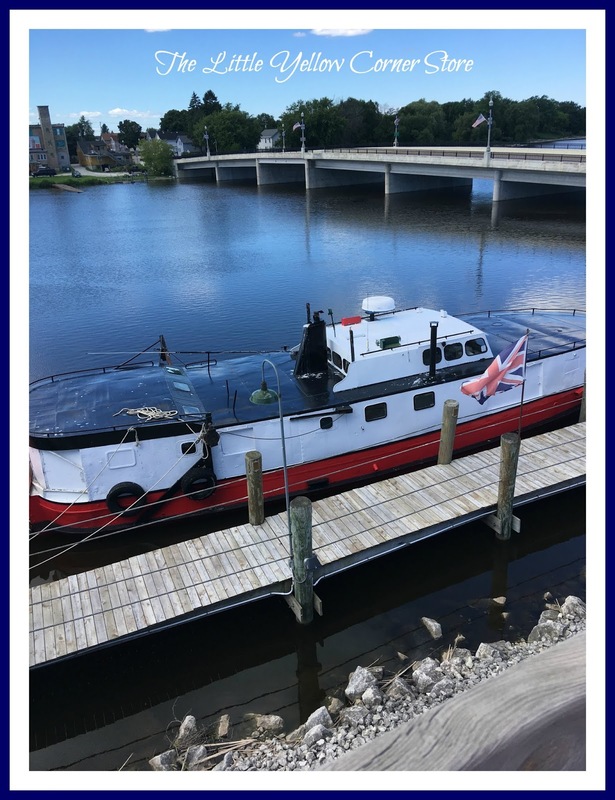 Below is another charming boat stationed in the Kewaunee Marina located twenty three miles north of Two Rivers, Wisconsin. 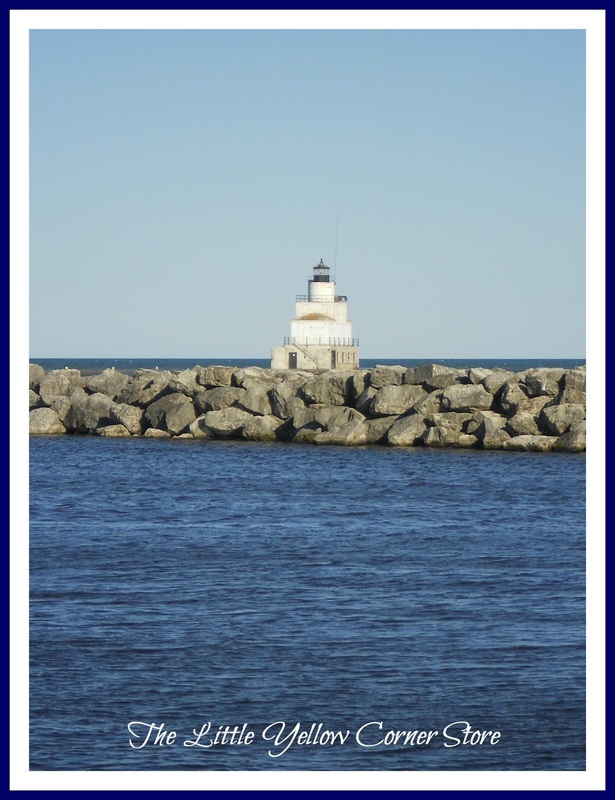 The Wisconsin Lake Michigan coastline is filled with fun and interesting fishing, boating and maritime history. 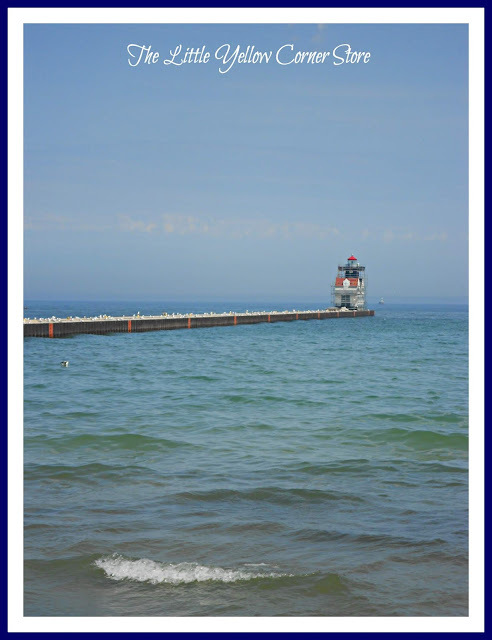 Come explore it for yourself! 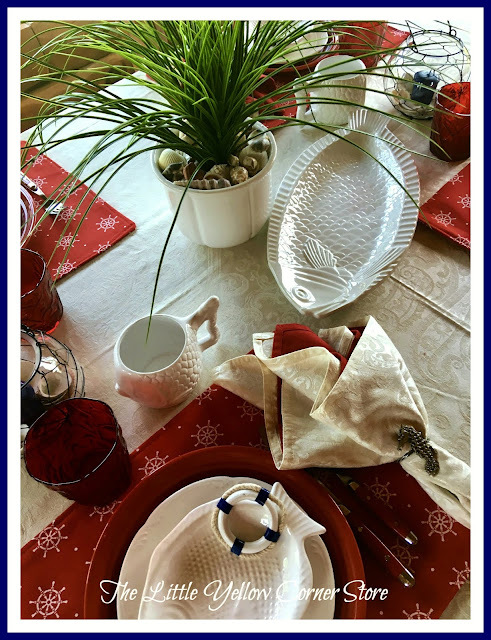 Thanks for sharing the village too - loved your tablescape as well! 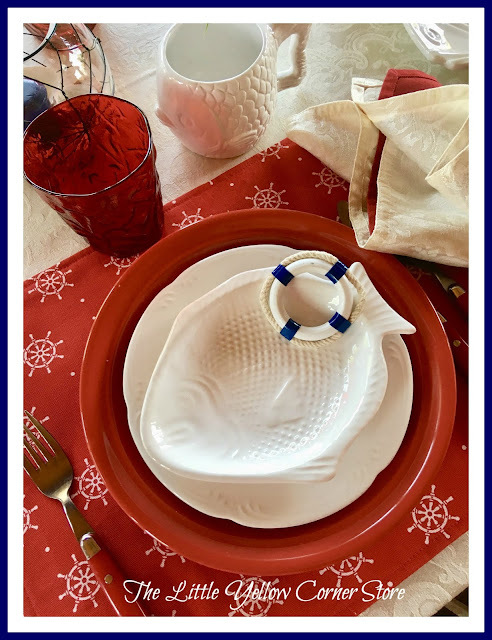 Cute table, like all the cute fish dishes! Thanks for the fishing town tour! I love the tablescape- especially the too cute fish mugs and the placemats you made. 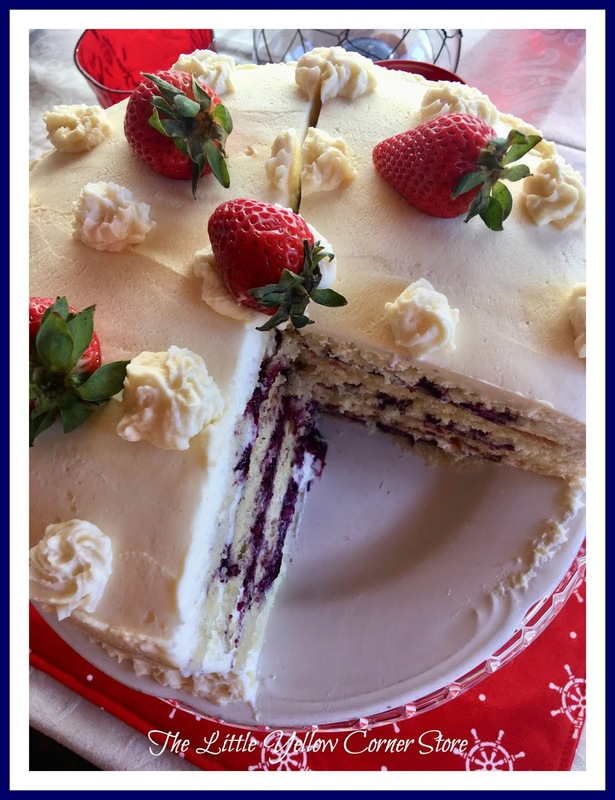 That cake has me wishing I could taste it right now! 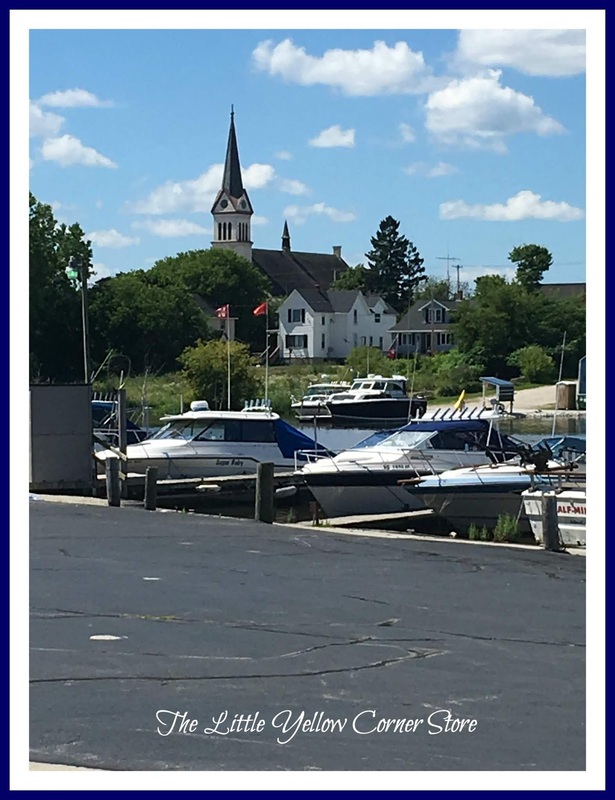 I enjoyed the pictures from the fishing village. It’s interesting and sad when you read about the ships that have gone down. 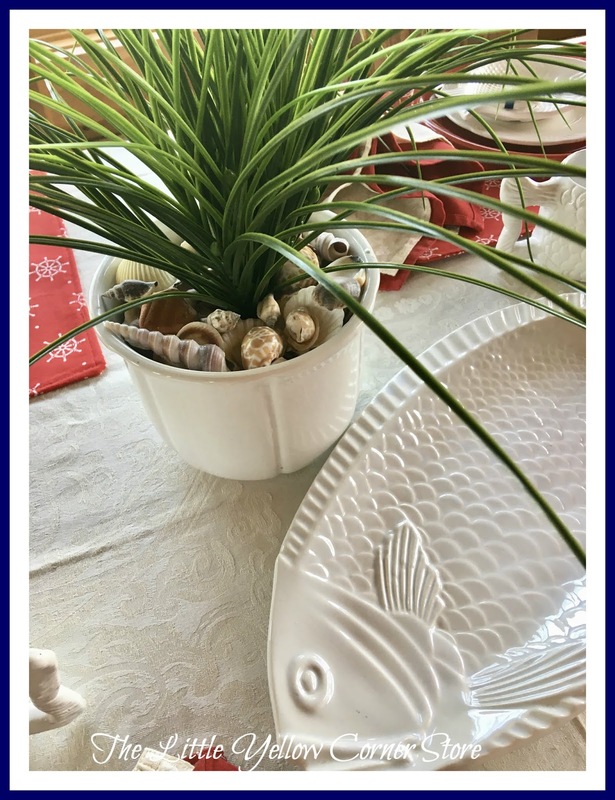 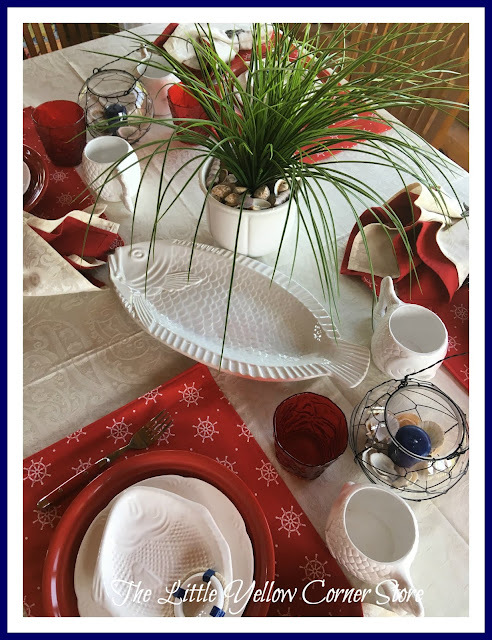 I like how you created the tablescape with thoughts of your visit to the fishing village! 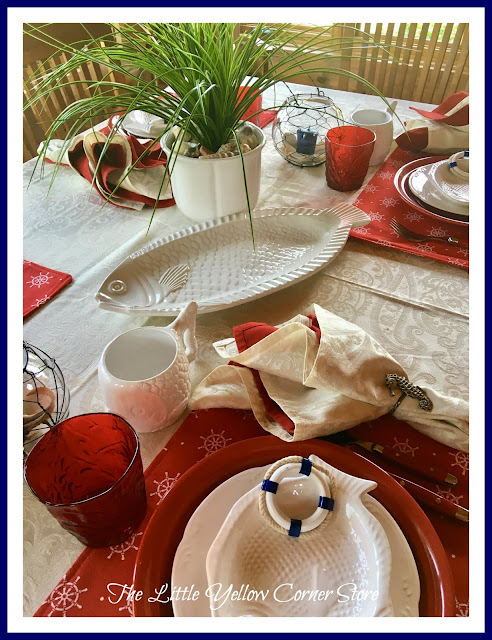 You absolutely, positively, have the best tablescapes in all of blog land! 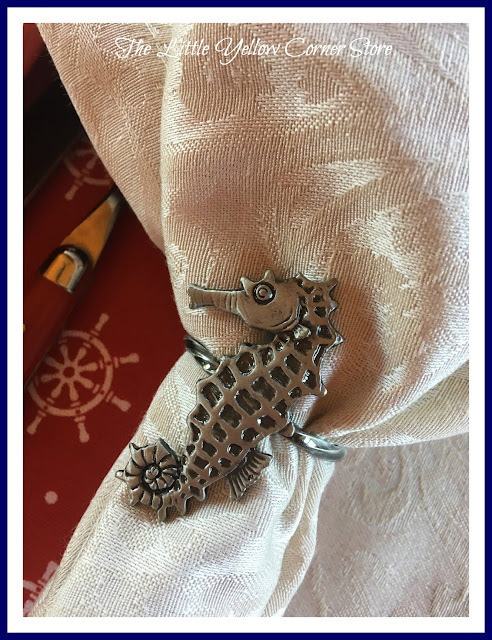 I have so much fun looking at your amazing creativity my friend, but I’m sure that’s because YOU have so much fun creating them and it shines through. 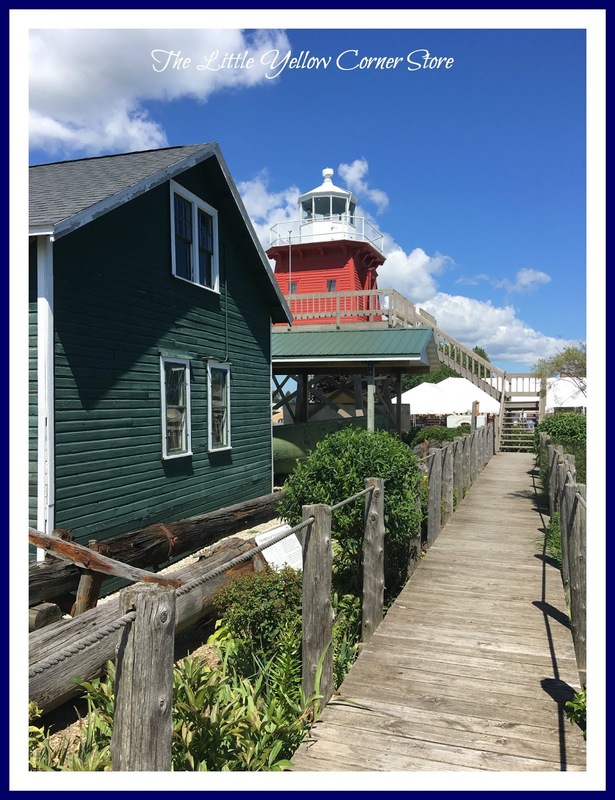 Such an interesting fishing village you visited. 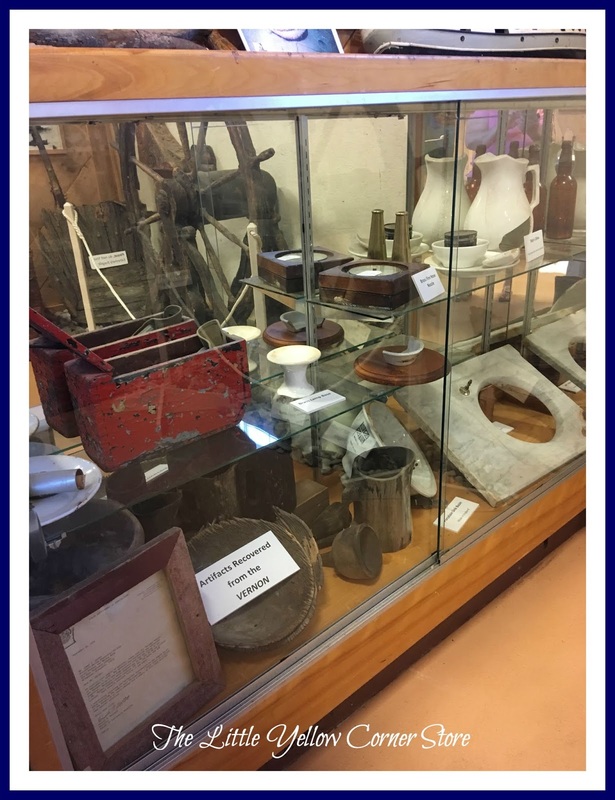 Lots of history there, so thanks for sharing. 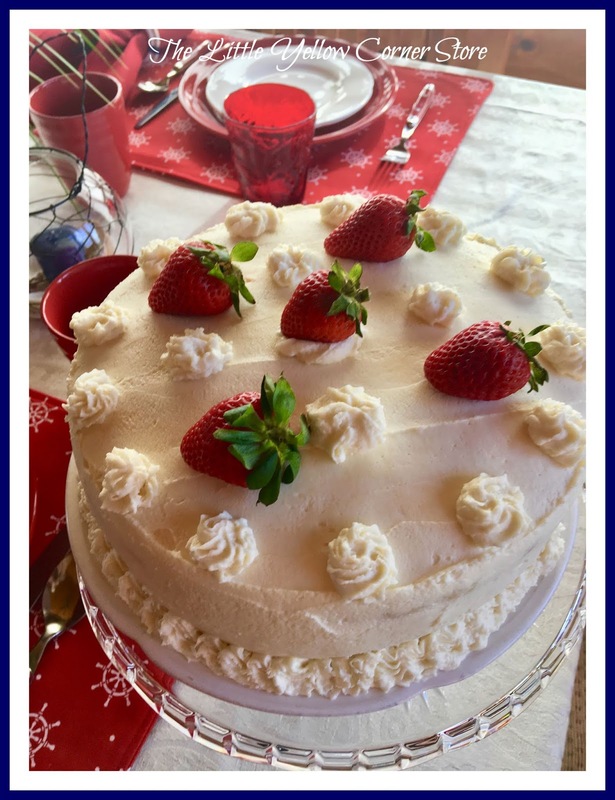 Marsha, Marsha, Marsha, you have done it again! 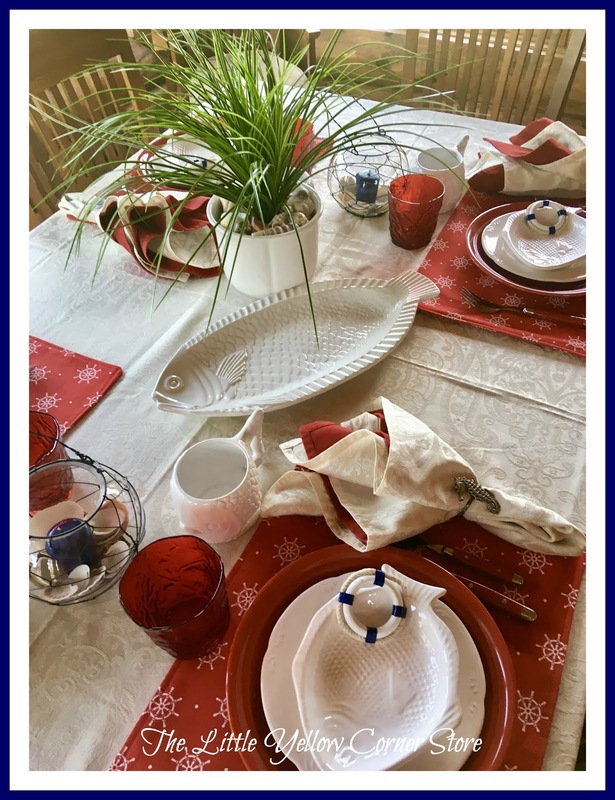 I love this gorgeous red and white sea worthy table. 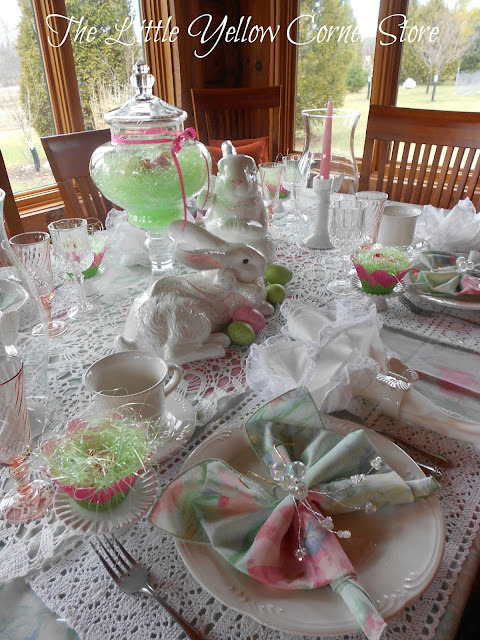 I also love that you include a dessert with your tables. 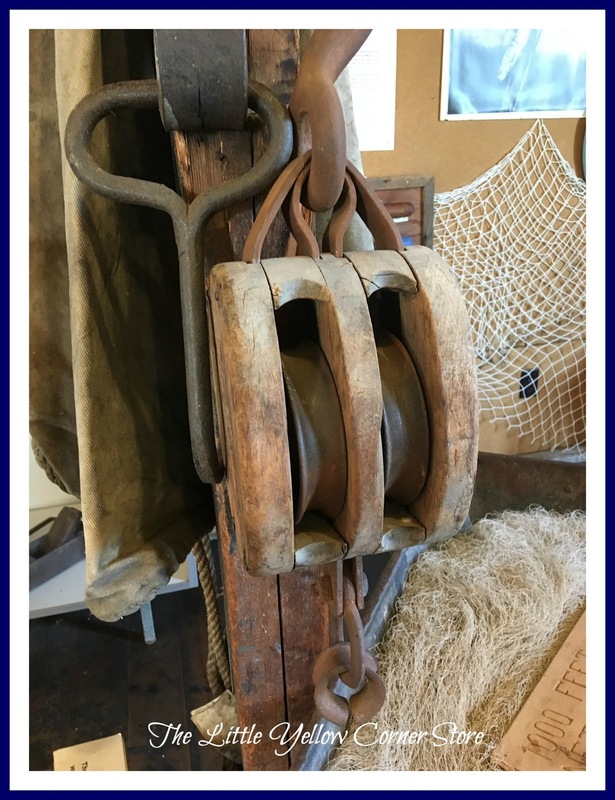 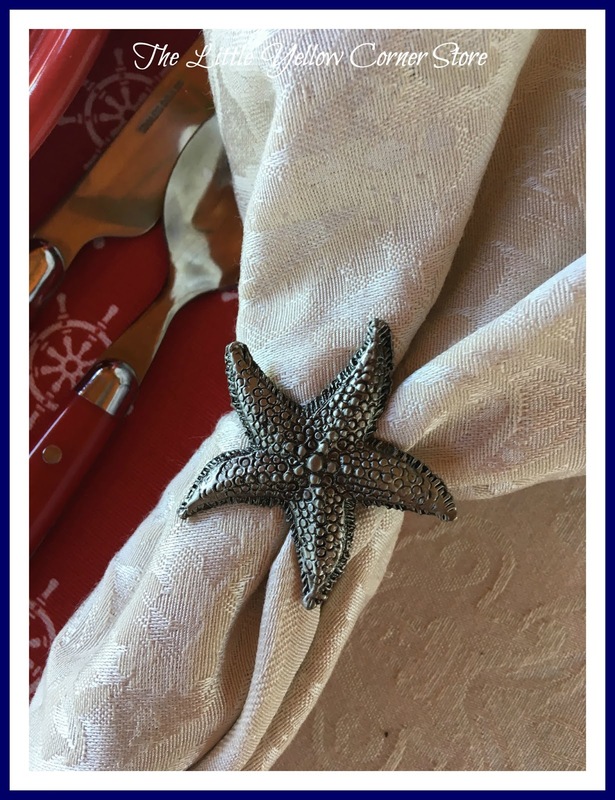 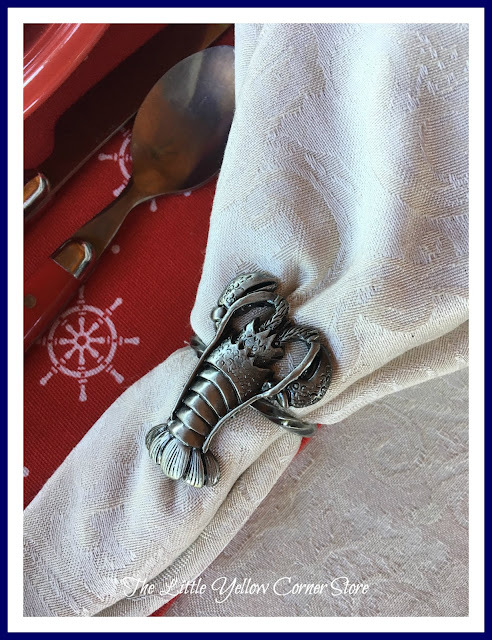 Thank you so much for sharing your table and all of the nautical inspired pictures. I hope you join us again next week at Celebrate Your Story.